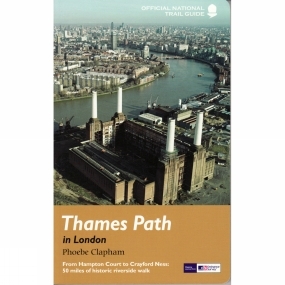 A completely new Trail Guide dedicated to the London section of the Thames Path from Hampton Court to the Thames Barrier. Until now, Aurums popular one-volume Thames Path guide has had all too little room to cover the endlessly rich array of sights and history along its London section, something to look at literally every yard of the way. Now, Aurum publishes a completely new walkers guide just to the London Thames, laid out to its new full-colour Trail Guide design, and including the extension to Crayford . Here is all the history along the river from the Mesolithic Period timber piles near Vauxhall Bridge to the new Shard skyscraper shooting skywards at London Bridge. It covers all the folklore from the famous frost fairs to the much-lamented beach near Tower Bridge, not forgetting the poignant recent visit of a large whale to the centre of London. The Thames winds all the way through Londons history and culture, from Henry VIII's Hampton Court to the chequered fate of the Dome/O2: the London resident as much as the visiting tourist will find in this guide something new every step of the way.